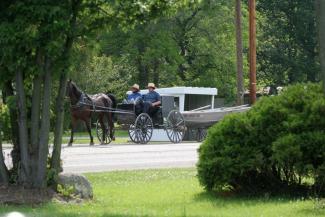 The Amish use horse and buggy for transportation. 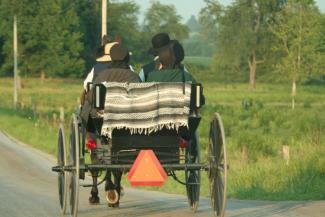 Unlike my grandfather, who bought his first buggy from Sears, we now have skilled Amish craftsmen who build our buggies. A new single-seat buggy can cost up to $4,000, but it will last a lifetime if taken good care of. 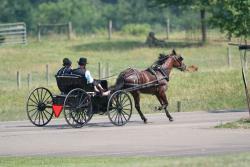 The buggies will vary some in style from one group of Amish to the next. There is a 12-volt storage battery to provide lights, and most buggies are equipped with hydraulic brakes to help when going downhill. We do not believe the automobile is wrong in itself - it is the fast-paced lifestyle that we wish to avoid. By refraining from ownership of the car, we endeavor to live a more slow-paced life. If we need to travel a greater distance than our horses can take us, we hire a taxi to take us. 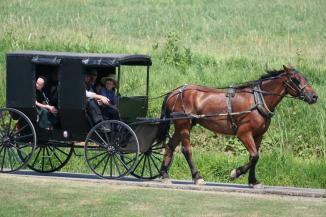 There are non-Amish people living in our community who make their living from doing taxi work for the Amish. Most of the horses that we use for our buggies are standardbred horses. They are either not fast enough for the racetrack or are retired from the track. Most horses can be used until they are 18 to 20 years old. There are dealers that buy them from the racetracks and then resell them to the Amish. Chapter from the Book, "OUR AMISH VALUES"